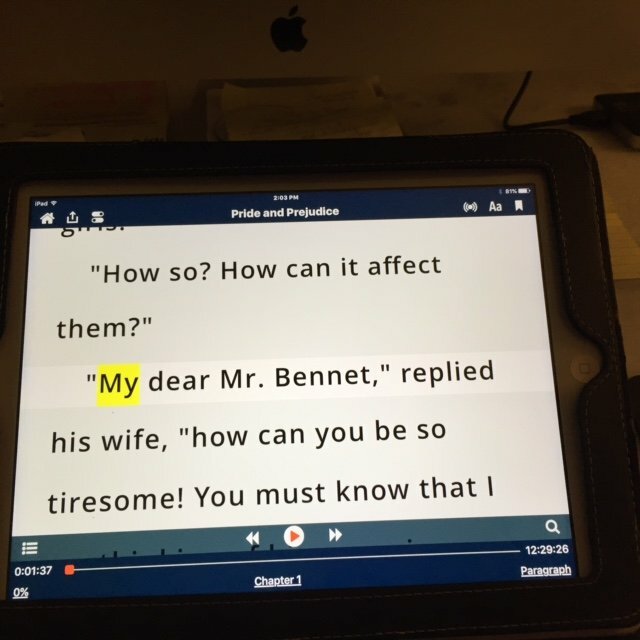 After more than two years of observing how Maya sees and reads, and almost pulling the trigger on a $3000.00 desktop magnifier/CCTV, we found an app called Voice Dream that addresses Maya’s visual processing and tracking needs!! Woohoo!! This was after a process that included lots of internet research, app trials, device trials and homemade tricks and tips that weren’t enough. And guess what? It only cost us $9.99. Yes. I. am. totally. serious. Here is a nice review/overview of the Voice Dream Reader. I have written several posts about Maya’s visual impairments both ocular–how the eye functions, and cortical–how information is sorted once it gets to the brain. We have struggled to find a way for Maya to read comfortably and independently. The sloppiness of our process has led her to become increasingly irritated with reading and I felt like we were in real trouble of her becoming stuck and sliding backward with her reading skills. From creating homemade view finders, to manually wrestling with the iPad so that her touch wouldn’t lead to an unintentional swipe, to page magnifiers and highlighters of all kinds, we have tried a lot. I was finally prepared to move forward with purchasing a desktop magnifier/CCTV device. We trialed one in our home last week and I was so thrilled by its capability. I posted a picture on my personal fb page of Maya using it successfully and expressing my relief. My friends and family were thrilled and oohed and aaahed over the technology. 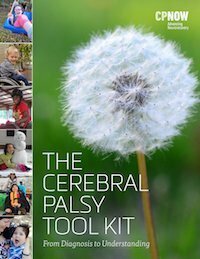 But one of my friends whose daughter is older and also has CP and a visual impairment, gently asked if I had considered using the iPad and the various apps that are compatible with it. Have I?!! Yes, and they either had terrible reviews, didn’t do what we wanted or were buggy. Hrumph, I thought to myself. I finally feel like I am confident enough to move forward and now I have more suggestions. That’s what many of us love and don’t love about Facebook right? But I knew this woman knows her stuff and I felt compelled to follow this one last lead. 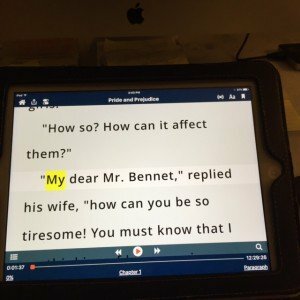 She asked me if we were using Bookshare, a free online free library for kids in the US (but also available internationally) who have documented visual impairments or disabilities that make it hard to read. I signed Maya up last year for Bookshare but after trying it myself I felt it wasn’t the answer for her. It certainly was a great free digital library but she needed more visual support than their online reader offered. I still decided to go back and check out their website again because this was a huge investment and I didn’t want to miss anything. How many times did I say to myself that there must be an app out there that can do what we need. And guess what? I found something there this time I had not seen before; a reader Bookshare suggested called Voice Dream. 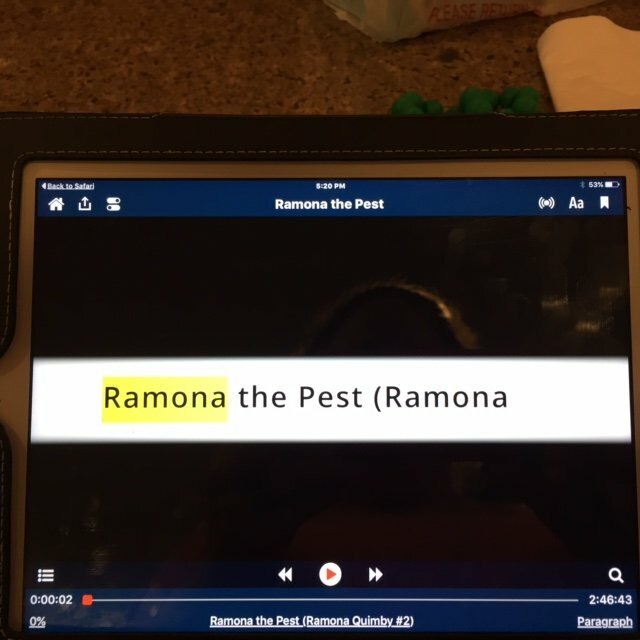 I tried it all afternoon and it didn’t act buggy, was compatible with the Bookshare library, had good reviews and had THE two non-negotiable functions Maya needs: the capability to isolate individual lines of text with black surround, and an option for her to freeze the screen for tracking with her finger. BINGO! This app has it and text to speech to boot. It also has text to speech options with voices that sound like real people instead of machines. At this time Maya is in a Montessori educational setting which means that her needs for visually accessing a blackboard or walls in the room or worksheets is almost zero–something desktop magnifiers and cameras are great for. When the time comes, and she is in a more traditional classroom, we will revisit the technology options at that time. For now we’ll hang on to the money we just saved and invest in a new iPad with a bigger screen and save the rest for other equipment Maya needs. I know it feels really good to diligently do your research and finally feel like you have made a confident decision. I was there. I was done. But this time, by following a friend’s suggestion I found something new that met our needs and offered us an enormous savings. This decision also allows Maya to continue to use her iPad, a piece of technology she is very comfortable with, that’s portable and that she can navigate on her own. It is often confusing to sort through the pros and cons of technology and equipment purchases, and it’s easy to get derailed by finding the first thing that meets your needs (and then some) or that looks really cool. I have developed a simple strategy to help me remain focused and that includes making a categorical list for purchases. I detail what Maya needs to get out of the technology or device, what we as her caregivers may need, what features may be non-negotiable and which features we would like for her or us to have but that we could live without. Perhaps I will add another strategy to my list and that is to ask fellow parents on Facebook one more time before making big purchases. This strategy led me to Voice Dream combined with Book Share and it’s a great solution for our family for right now. And to think that the developer got started on this as a hobby. **The photos at the top illustrate one of the features of Voice Dream Reader which is to isolate lines of texts. The highlighting you see in yellow occurs when the text to speech option is activated. I love Bookshare, we,ve been using it for a few years now. Sarah even had access to some of her school texts on it. We used the daisy reader app when we initially signed up, but switched to voice dream and liked it much better. NINDS National Institute of Neurological Disorders and Stroke (NINDS) is one part of the NIH and conducts and supports research on brain and nervous system disorders. © 2016 CP Daily Living Inc. All Rights Reserved.